With marine conservation as the theme of this year’s 50th anniversary event, Sunseeker and Blue Marine Foundation (BLUE) highlighted at the Southhampton boat show the current issue with an immersive experience that demonstrated the importance of protecting our seas and oceans for future generations. On September 14th there was an exhibition space to educate and inform visitors about marine conservation showing Project Menorca which is carried out with the Menorca Preservation Fund alongside with its local partners. Sunseeker showed its commitment to address the problem with details about its partnership with BLUE a and its recently launched marine conservation program in Menorca with the Menora Preservation Foundation, “Project Menorca” that will establish a recognized model of conservation, supported by its partner on the island, the Menorca Preservation Fund. Project Menorca will support local fishermen in the creation of a sustainable fishing model, establish a network of “ecological moorings” to preserve the beds of posidorine grasslands, protect marine reserves through the elimination of plastics and fishing nets “ghosts”, distribute recyclable bags throughout the island and strengthen marine surveillance, among other proposal. As part of the exhibition at Southampton Boat Show, the solutions that Sunseeker is implementing in Menorca stand out as tangible ways to encourage everyone to think about how they can help protect our most valuable resource. Sunseeker’s booth desing at Solent Park included a captivating exhibition along with its long-term partner, BLUE; a non-profit organization dedicated to creating marine reserves around the world and improving biodiversity that is currently working with Menorca Preservation Fund in Menorca. The exhibition, was free for the people invited to the event, highlighted the facts and the problems that we are currently facing worldwide due to an increasing pressure from unregulated fishing, tourism and pollution. Lead singer of iconic British band Duran Duran, Simon Le Bon, was the special guest at the year’s 50th anniversary show. 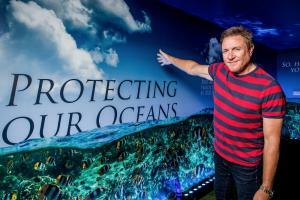 At the Sunseeker stage he highlighted the importance of protecting the marine environment for future generations.Simon, a long-serving ambassador of The Blue Marine Foundation (BLUE), officially opened the Sunseeker stand and BLUE exhibition space. The exhibition, located on the stand, highlighted the problems we currently face globally and while at the show Simon spoke passionately about the increased pressure we are facing from unregulated fishing, tourism and pollution. Rory Moore, senior project manager at the Blue Marine Foundation. 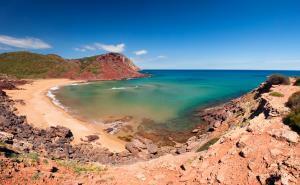 “Menorca has a marine protected area but it isn’t being properly monitored. With a new protected area announced and the planned expansion of the Biosphere Reserve, now seems like the perfect time for Blue and Sunseeker to step in and help local organisations. Simon Clare (Marketing Director at Sunseeker International) said that Sunseeker is delighted to have included an exhibition space at this year’s show following our launch of ‘Project Menorca’.